I really enjoy the challenge of raiding the fridge or pantry in the search of ingredients to improvise a meal. Here I had some poached wild salmon and cooked rice leftover from the previous nights dinner. 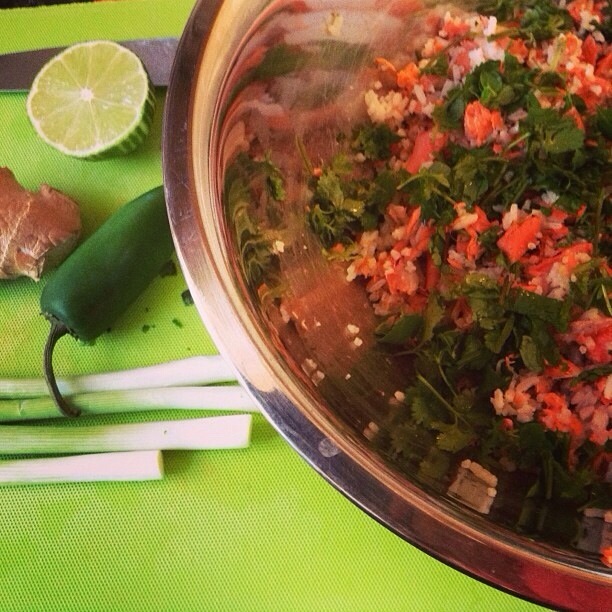 Simply add to the mixed rice and flaked salmon, some chopped spring onions, chopped fresh coriander and basil, grated ginger, lime zest and egg white. 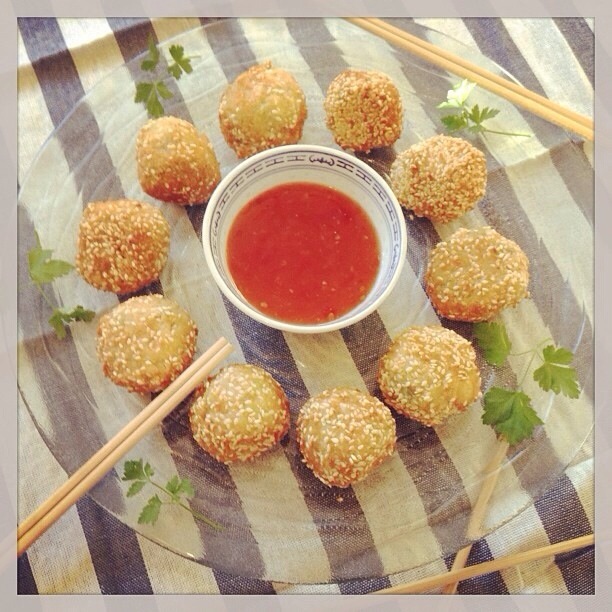 Form into small bite size balls and roll in cornflour, egg and breadcrumbs mixed with sesame seeds. Fry gently or for a healthier options bake in the oven. Me encanta el desafío de usar cualquier ingrediente en la nevera o despensa para crear un plato. Aqui tenia salmón salvaje pochado y arroz que sobraron de la cena del día anterior. Simplemente añade a la mezcla de salmón y arroz, cebollinos picados, cilantro y albahaca frescas tambien picados, jengibre rallado, ralladura de lima y clara de huevo. Mezcla y forma bolitas pequeñas, pasalas por harina de maíz, huevo y pan rallado mezclado con semillas de sésamo. Frielas a fuego suave o para una opción más sana asa en el horno. This entry was posted in baking, catering, cooking, eating out, fitness, food, health, home, home cooking, kitchen, love, nutrition, snacks, world food and tagged catering, chilli, food, leftovers, love, party, salmon, thai. Bookmark the permalink.